Poetry In Motion. Awakening Vinyasa. Kalyani, (Colleen Buckman), is an Artist and a Holistic Healer. She combines her unique expressions of songwriting, holistic healing, yogic philosophy, education, production, directing and global exploration, to create a rich and diverse life landscape. Her foundation was set as a young singer and actor, performing in commercials, plays, and musicals. After completing a double B.A in English Literature and Theatrical Performance, she honed her craft as a singer, actor, writer and educator. She discovered her passion and knack for songwriting in college. Songwriting led her to guitar playing and a calling for storytelling through melody and lyrics. She composed, produced and arranged her first solo album, Sometimes in the Sun, in 2007. In the fall of 2008, she began a small production company called Fair Trade Om (www.fairtradeom.com), and launched Raising The Consciousness (www.raisingtheconsciousness.com) a radio show and media events company with Susan Shehata and Keith Helke. Colleen has since performed at, produced or co-produced numerous events and festivals including Project Earth, The Twin Cities Annual Kirtan Festival, Minneapolis Yoga Festival, An Evening with Deva Premal, Miten & Manose, and cOMmon Grounds Yoga and Music Festival. Colleen, Susan and Keith have a Kirtan band, Sitara&Kalyani with Pavan Kumar, that released their first CD last winter. 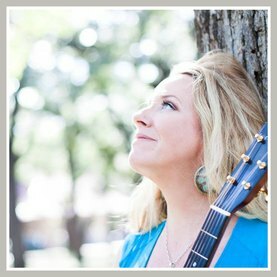 Colleen is currently a touring musician, holistic healer and event producer.